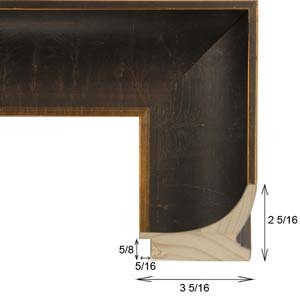 The style of this oiled bronze scooped wood picture frame fits in several design settings, especially living spaces with warm tones that complement the copper undertones of this scooped wood frame. 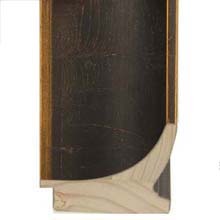 Rooms that feature browns and yellows in its decor, along with khaki, tan, and spicy burnt orange and red may benefit from the addition of this frame into the decorative arena. Subject matter that may benefit from the look of this oiled bronze picture frame includes vintage images, such as figurative illustrations, maps, drawings of ships, and perhaps even still life paintings of flowers or a landscape of aspen trees in autumn. For matted works on paper such as posters, prints, and original watercolor paintings and drawings, consider using acid free archival mats, such as Bruxelles 9853, Tusk 9516, Spice 9836, Catcher’s Mitt 9584, Fossil 9511, Toasty 9514, Wet Sand 9515, and Fawn 9815.